Used by thousands of IT professionals and security researchers worldwide, the Remote Desktop Protocol (RDP) is usually considered a safe and trustworthy application to connect to remote computers. Whether it is used to help those working remotely or to work in a safe VM environment, RDP clients are an invaluable tool. However, Check Point Research recently discovered multiple critical vulnerabilities in the commonly used Remote Desktop Protocol (RDP) that would allow a malicious actor to reverse the usual direction of communication and infect the IT professional or security researcher’s computer. Such an infection could then allow for an intrusion into the IT network as a whole. 16 major vulnerabilities and a total of 25 security vulnerabilities were found overall. The full list can be found in Appendix A & B. The Remote Desktop Protocol (RDP), also known as “mstsc” after the Microsoft built-in RDP client, is commonly used by technical users and IT staff to connect to / work on a remote computer. RDP is a proprietary protocol developed by Microsoft and is usually used when a user wants to connect to a remote Windows machine. There are also some popular open-source clients for the RDP protocol that are used mainly by Linux and Mac users. RDP offers many complex features, such as: compressed video streaming, clipboard sharing, and several encryption layers. We therefore decided to look for vulnerabilities in the protocol and its popular implementations. In a normal scenario, you use an RDP client, and connect to a remote RDP server that is installed on the remote computer. After a successful connection, you now have access to and control of the remote computer, according to the permissions of your user. But if the scenario could be put in reverse? We wanted to investigate if the RDP server can attack and gain control over the computer of the connected RDP client. Attacking an IT member that connects to an infected work station inside the corporate network, thus gaining higher permission levels and greater access to the network systems. Attacking a malware researcher that connects to a remote sandboxed virtual machine that contains a tested malware. This allows the malware to escape the sandbox and infiltrate the corporate network. mstsc.exe – Microsoft’s built-in RDP client. FreeRDP – The most popular and mature open-source RDP client on Github. rdesktop – Older open-source RDP client, comes by default in Kali-linux distros. Fun fact: As “rdesktop” is the built-in client in Kali-linux, a Linux distro used by red teams for penetration testing, we thought of a 3rd (though probably not practical) attack scenario: Blue teams can install organizational honeypots and attack red teams that try to connect to them through the RDP protocol. As is usually the case, we decided to start looking for vulnerabilities in the open source clients. It seems that it will only make sense to start reverse engineer Microsoft’s client after we will have a firm understanding of the protocol. In addition, if we find common vulnerabilities in the two open sourced clients, we could check if they also apply to Microsoft’s client. In a recon check it looked like “rdesktop” is smaller than “FreeRDP” (has fewer lines of code), and so we selected it as our first target. Note: We decided to perform an old-fashioned manual code audit instead of using any fuzzing technique. The main reasons for this decision were the overhead of writing a dedicated fuzzer for the complex RDP protocol, together with the fact that using AFL for a protocol with several compression and encryption layers didn’t look like a good idea. After a short period, it looked like the decision to manually search for vulnerabilities paid off. We soon found several vulnerable patterns in the code, making it easier to “feel” the code, and pinpoint the locations of possible vulnerabilities. We found 11 vulnerabilities with a major security impact, and 19 vulnerabilities overall in the library. For the full list of CVEs for “rdesktop”, see Appendix A. Note: An additional recon showed that the xrdp open-source RDP server is based on the code of “rdesktop”. Based on our findings, it appears that similar vulnerabilities can be found in “xrdp” as well. Instead of a technical analysis of all of the CVEs, we will focus on two common vulnerable code patterns that we found. As we can see, the fields “length” and “flags” are parsed from the stream “s”, without checking that “s” indeed contains the required 8 bytes for this parsing operation. While this usually only leads to an Out-Of-Bounds read, we can combine this vulnerability with an additional vulnerability in several of the inner channels and achieve a much more severe effect. By reading too much data from the stream, i.e. sending a chopped packet to the client, the invariant that “s->p <= s->end” breaks. This leads to an Integer-Underflow when calculating “pkglen”, and to an additional Integer-Overflow when allocating “xmalloc(pkglen + 1)” bytes for our buffer, as can be seen in my comment above the call to “xmalloc”. Together with the proprietary implementation of “STRNCPY”, seen in Figure 4, we can trigger a massive heap-based buffer overflow when copying data to the tiny allocated heap buffer. By chaining together these two vulnerabilities, found in three different logical channels, we now have three remote code execution vulnerabilities. Although “width” and “height” are only 16 bits each, by multiplying them together with “Bpp” (bits-per-pixel), we can trigger an Integer-Overflow. Later on, the bitmap decompression will process our input and break on any decompression error, giving us a controllable heap-based buffer-overflow. Note: This tricky calculation can be found in several places throughout the code of “rdesktop”, so we marked it as a potential vulnerability to check for in “FreeRDP”. After finding multiple vulnerabilities in “rdesktop”, we approached “FreeRDP” with some trepidation; perhaps only “rdesktop” had vulnerabilities when implementing RDP? We still can’t be sure that every implementation of the protocol will be vulnerable. And indeed, at first glance, the code seemed much better: there are minimal size checks before parsing data from the received packet, and the code “feels” more mature. It is going to be a challenge. However, after a deeper examination, we started to find cracks in the code, and eventually we found critical vulnerabilities in this client as well. We found 5 vulnerabilities with major security impact, and 6 vulnerabilities overall in the library. For the full list of CVEs for “FreeRDP”, see Appendix B. Note: An additional recon showed that the RDP client NeutrinoRDP is a fork of an older version (1.0.1) of “FreeRDP” and therefore probably suffers from the same vulnerabilities. As can be seen in Figure 7, there is an Integer-Truncation when trying to calculate the required capacity for the bitmap updates array. Later on, rectangle structs will be parsed from our packet and into the memory of the too-small allocated buffer. This specific vulnerability is followed by a controlled amount (“bitmapUpdate->number”) of heap allocations (with a controlled size) when the rectangles are parsed and stored to the array, granting the attacker a great heap-shaping primitive. The downside of this vulnerability is that most of the rectangle fields are only 16 bits wide, and are upcasted to 32 bits to be stored in the array. Despite this, we managed to exploit this CVE in our PoC. Even this partially controlled heap-based buffer-overflow is enough for a remote code execution. rdpbase.dll – Protocol layer for the RDP client. rdpserverbase.dll – Protocol layer for the RDP server. rdpcore.dll / rdpcorets.dll – Core logic for the RDP engine. rdpclip.exe – An .exe we found and that we will introduce later on. mstscax.dll – Mostly the same RDP logic, used by mstsc.exe. Several optimization layers for efficient network streaming of the received video. Robust decompression checks, to guarantee that no byte will be written past the destination buffer. Needless to say, there were checks for Integer-Overflows when processing bitmap updates. Wait a minute, they share a clipboard? When we checked “rdesktop” and “FreeRDP”, we found several vulnerabilities in the clipboard sharing channel (every logical data layer is called a channel). However, at the time, we didn’t pay much attention to it because they only shared two formats: raw text and Unicode text. This time it seems that Microsoft supports several more shared data formats, as the switch table we saw was much bigger than before. After reading more about the different formats in MSDN, one format immediately attracted our attention: “CF_HDROP”. This format seems responsible for “Drag & Drop” (hence the name HDROP), and in our case, the “Copy & Paste” feature. It’s possible to simply copy a group of files from the first computer, and paste them in the second computer. For example, a malware researcher might want to copy the output log of his script from the remote VM to his desktop. It was roughly at this point, while I was trying to figure out the flow of the data, Omer (@GullOmer) asked me if and where PathCanonicalizeA is called. If the client fails to properly canonicalize and sanitize the file paths it receives, it could be vulnerable to a path-traversal attack, allowing the server to drop arbitrary files in arbitrary paths on the client’s computer, a very strong attack primitive. After failing to find imports for the canonicalization function, we dug in deeper, trying to figure out the overall architecture for this data flow. This is where rdpclip.exe comes into play. It turns out that the server accesses the clipboard through a broker, and that is rdpclip.exe. In fact, rdpclip.exe is just a normal process (we can kill / spawn it ourselves) that talks to the RDP service using a dedicated virtual channel API. At this stage, we installed ClipSpy, and started to dynamically debug the clipboard’s data handling that is done inside rdpclip.exe. On the server, the “copy” operation creates a clipboard data of the format “CF_HDROP”. When the “paste” is performed in the client’s computer, a chain of events is triggered. The rdpclip.exe process on the server is asked for the clipboard’s content, and converts it to a FileGroupDescriptor (Fgd) clipboard format. The metadata of the files is added to the descriptor one at a time, using the HdropToFgdConverter::AddItemToFgd() function. After it is finished, the Fgd blob is sent to the RDP service on the server. The server simply wraps it and sends it to the client. The client unwraps it and stores it in its own clipboard. A “paste” event is sent to the process of the focused window (for example, explorer.exe). This process handles the event and reads the data from the clipboard. 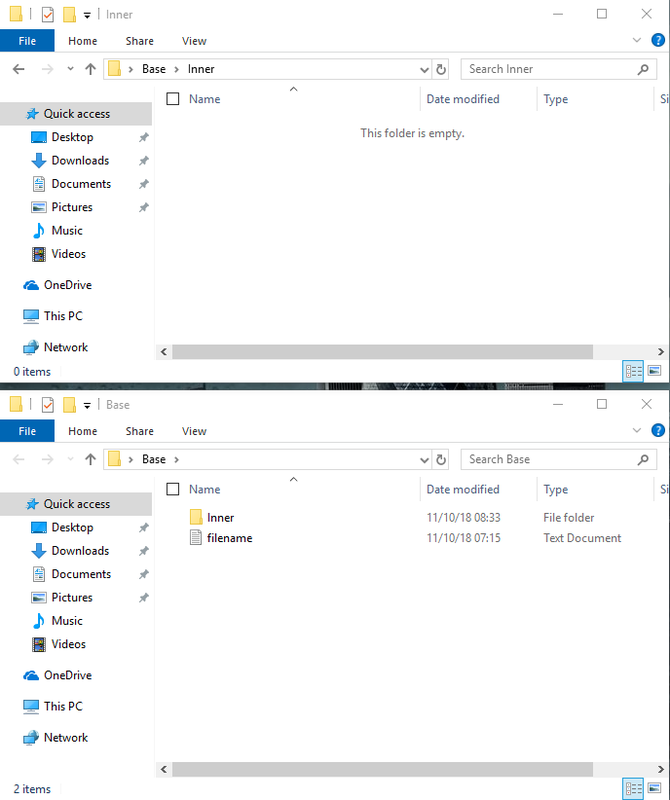 The content of the files is received over the RDP connection itself. If a client uses the “Copy & Paste” feature over an RDP connection, a malicious RDP server can transparently drop arbitrary files to arbitrary file locations on the client’s computer, limited only by the permissions of the client. For example, we can drop malicious scripts to the client’s “Startup” folder, and after a reboot they will be executed on his computer, giving us full control. Note: In our exploit, we simply killed rdpclip.exe, and spawned our own process to perform the path traversal attack by adding additional malicious file to every “Copy & Paste” operation. The attack was performed with “user” permissions, and does not require the attacker to have “system” or any other elevated permission. Every time a clipboard is updated on either side of the RDP connection, a CLIPRDR_FORMAT_LIST message is sent to the other side, to notify it about the new clipboard formats that are now available. We can think of it as a complete sync between the clipboards of both parties (except for a small set of formats that are treated differently by the RDP connection itself). This means that our malicious server is notified whenever the client copies something to his “local” clipboard, and it can now query the values and read them. In addition, the server can notify the client about a clipboard “update” without the need for a “copy” operation inside the RDP window, thus completely controlling the client’s clipboard without being noticed. A malicious RDP server can eavesdrop on the client’s clipboard – this is a feature, not a bug. For example, the client locally copies an admin password, and now the server has it too. A malicious RDP server can modify any clipboard content used by the client, even if the client does not issue a “copy” operation inside the RDP window. If you click “paste” when an RDP connection is open, you are vulnerable to this kind of attack. For example, if you copy a file on your computer, the server can modify your (executable?) file / piggy-back your copy to add additional files / path-traversal files using the previously shown PoC. The server executes their PoC, and positions in the clipboard a .NET content that will pop a calculator (using the “System.String” format). When the client clicks “paste” inside the PowerShell program, the deserialization occurs and a calc is popped. Note: The content of the synced clipboard is subject to Delayed Rendering. This means that the clipboard’s content is sent over the RDP connection only after a program actively asks for it, usually by clicking “paste”. Until then, the clipboard only holds the list of formats that are available, without holding the content itself. 16 October 2018 – Vulnerability was disclosed to Microsoft. 22 October 2018 – Vulnerabilities were disclosed to FreeRDP. 22 October 2018 – FreeRDP replied and started working on a patch. 28 October 2018 – Vulnerabilities were disclosed to rdesktop. 5 November 2018 – FreeRDP sent us the patches and asked for us to verify them. 18 November 2018 – We verified the patches of FreeRDP, and gave them a “green light” to continue. 20 November 2018 – FreeRDP committed the patches to their Github as part of 2.0.0-rc4. 17 December 2018 – Microsoft acknowledged our findings. For more information, see Microsoft’s Response. 19 December 2018 – rdesktop sent us the patches and asked us to verify them. 19 December 2018 – We verified the patches of rdesktop, and gave them a “green light” to continue. 16 January 2019 – rdesktop committed the patches to their Github as part of v1.8.4. During our research, we found numerous critical vulnerabilities in the tested RDP clients. Although the code quality of the different clients varies, as can be seen by the distribution of the vulnerabilities we found, we argue that the remote desktop protocol is complicated, and is prone to vulnerabilities. As we demonstrated in our PoCs for both Microsoft’s client and one of the open-sourced clients, a malicious RDP server can leverage the vulnerabilities in the RDP clients to achieve remote code execution over the client’s computer. As RDP is regularly used by IT staff and technical workers to connect to remote computers, we highly recommend that everyone patch their RDP clients. In addition, due to the nature of the clipboard findings we showed in Microsoft’s RDP client, we recommend users to disable the clipboard sharing channel (on by default) when connecting to a remote machine. Check Point Research worked closely with FreeRDP, rdesktop and Microsoft to mitigate these vulnerabilities. Check Point provides various security layers that may be used for protection such as IPS, SandBlast Agent, Threat Emulation and ANTEX. Users should avoid using RDP to connect to remote servers that have not implemented sufficient security measures. CVE 2018-8791: rdesktop versions up to and including v1.8.3 contain an Out-Of-Bounds Read in function rdpdr_process() that results in an information leak. CVE 2018-8792: rdesktop versions up to and including v1.8.3 contain an Out-Of-Bounds Read in function cssp_read_tsrequest() that results in a Denial of Service (segfault). CVE 2018-8793: rdesktop versions up to and including v1.8.3 contain a Heap-Based Buffer Overflow in function cssp_read_tsrequest() that results in a memory corruption and probably even a remote code execution. CVE 2018-8794: rdesktop versions up to and including v1.8.3 contain an Integer Overflow that leads to an Out-Of-Bounds Write in function process_bitmap_updates() and results in a memory corruption and possibly even a remote code execution. CVE 2018-8795: rdesktop versions up to and including v1.8.3 contain an Integer Overflow that leads to a Heap-Based Buffer Overflow in function process_bitmap_updates() and results in a memory corruption and probably even a remote code execution. CVE 2018-8796: rdesktop versions up to and including v1.8.3 contain an Out-Of-Bounds Read in function process_bitmap_updates() that results in a Denial of Service (segfault). CVE 2018-8797: rdesktop versions up to and including v1.8.3 contain a Heap-Based Buffer Overflow in function process_plane() that results in a memory corruption and probably even a remote code execution. CVE 2018-8798: rdesktop versions up to and including v1.8.3 contain an Out-Of-Bounds Read in function rdpsnd_process_ping() that results in an information leak. CVE 2018-8799: rdesktop versions up to and including v1.8.3 contain an Out-Of-Bounds Read in function process_secondary_order() that results in a Denial of Service (segfault). CVE 2018-8800: rdesktop versions up to and including v1.8.3 contain a Heap-Based Buffer Overflow in function ui_clip_handle_data() that results in a memory corruption and probably even a remote code execution. CVE 2018-20174: rdesktop versions up to and including v1.8.3 contain an Out-Of-Bounds Read in function ui_clip_handle_data() that results in an information leak. CVE 2018-20175: rdesktop versions up to and including v1.8.3 contains several Integer Signedness errors that leads to Out-Of-Bounds Reads in file mcs.c and result in a Denial of Service (segfault). CVE 2018-20176: rdesktop versions up to and including v1.8.3 contains several Out-Of-Bounds Reads in file secure.c that result in a Denial of Service (segfault). CVE 2018-20177: rdesktop versions up to and including v1.8.3 contain an Integer Overflow that leads to a Heap-Based Buffer Overflow in function rdp_in_unistr() and results in a memory corruption and possibly even a remote code execution. CVE 2018-20178: rdesktop versions up to and including v1.8.3 contain an Out-Of-Bounds Read in function process_demand_active() that results in a Denial of Service (segfault). CVE 2018-20179: rdesktop versions up to and including v1.8.3 contain an Integer Underflow that leads to a Heap-Based Buffer Overflow in function lspci_process() and results in a memory corruption and probably even a remote code execution. CVE 2018-20180: rdesktop versions up to and including v1.8.3 contain an Integer Underflow that leads to a Heap-Based Buffer Overflow in function rdpsnddbg_process() and results in a memory corruption and probably even a remote code execution. CVE 2018-20181: rdesktop versions up to and including v1.8.3 contain an Integer Underflow that leads to a Heap-Based Buffer Overflow in function seamless_process() and results in a memory corruption and probably even a remote code execution. CVE 2018-20182: rdesktop versions up to and including v1.8.3 contain a Buffer Overflow over the global variables in function seamless_process_line() that results in a memory corruption and probably even a remote code execution. CVE 2018-8784: FreeRDP prior to version 2.0.0-rc4 contains a Heap-Based Buffer Overflow in function zgfx_decompress_segment() that results in a memory corruption and probably even a remote code execution. CVE 2018-8785: FreeRDP prior to version 2.0.0-rc4 contains a Heap-Based Buffer Overflow in function zgfx_decompress() that results in a memory corruption and probably even a remote code execution. CVE 2018-8786: FreeRDP prior to version 2.0.0-rc4 contains an Integer Truncation that leads to a Heap-Based Buffer Overflow in function update_read_bitmap_update() and results in a memory corruption and probably even a remote code execution. CVE 2018-8787: FreeRDP prior to version 2.0.0-rc4 contains an Integer Overflow that leads to a Heap-Based Buffer Overflow in function gdi_Bitmap_Decompress() and results in a memory corruption and probably even a remote code execution. CVE 2018-8788: FreeRDP prior to version 2.0.0-rc4 contains an Out-Of-Bounds Write of up to 4 bytes in function nsc_rle_decode() that results in a memory corruption and possibly even a remote code execution. CVE 2018-8789: FreeRDP prior to version 2.0.0-rc4 contains several Out-Of-Bounds Reads in the NTLM Authentication module that results in a Denial of Service (segfault).